We’re here to make your life easier! 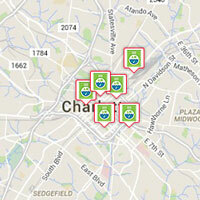 We want to change the way Charlotte does dry cleaning and wash & fold. Our mission; To revolutionize dry cleaning and laundry using mobile technology. By leveraging modern technology, we’re able to bring great service, quality and 24/7 convenience to an industry that’s barely changed in 200 years. Born from our owners’ own experience having to leave work early just to pick up dry cleaning, we strived to discover a better way, a simpler way. And so, we not only founded Locker Revolution, we became its first customers, because just like you, we simply needed a convenient, quality dry cleaners. So please, join us in our Locker Revolution! I guarantee we’ll change the world of dry cleaning and laundry forever.